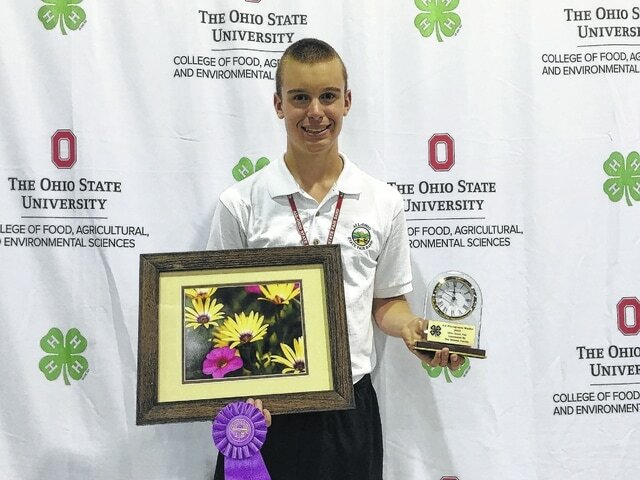 Spencer Minyo, son of Buck and Debbie Minyo, won a clock trophy at the 2016 Ohio State Fair in the Photography Master category. He has taken several photography projects during his 4-H career and is proud to have achieved this goal. His photo will be displayed at the Nationwide & Ohio Farm Bureau 4-H Center on the Ohio State University Campus in the A.B. Graham Hall. The photo will also be on display at the 2017 Ohio State Fair. This is the second photo Minyo has had chosen as one of the “Select Twenty” during his 4-H career. Minyo is a member of the Charm-n-Farm 4-H Club and is a junior at Washington High School. https://www.recordherald.com/wp-content/uploads/sites/27/2016/08/web1_SPENCER.jpgSpencer Minyo, son of Buck and Debbie Minyo, won a clock trophy at the 2016 Ohio State Fair in the Photography Master category. He has taken several photography projects during his 4-H career and is proud to have achieved this goal. His photo will be displayed at the Nationwide & Ohio Farm Bureau 4-H Center on the Ohio State University Campus in the A.B. Graham Hall. The photo will also be on display at the 2017 Ohio State Fair. This is the second photo Minyo has had chosen as one of the “Select Twenty” during his 4-H career. Minyo is a member of the Charm-n-Farm 4-H Club and is a junior at Washington High School.